This is a commission slot. You can hire artofawang to create a personalized artwork of this sort here. The artist will most likely respond to a request within the same day. This commission slot was rated positively by 18 clients thus far. 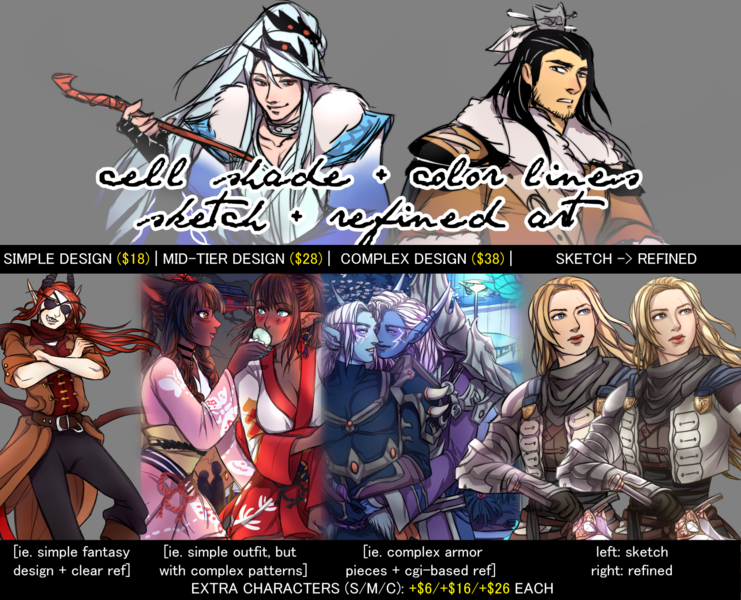 Paypal only + payment taken upfront; I will not start on your piece until after the commission has been marked as PAID. This option is only available after the sketch commission has been fully processed. Full payment must be made before I start. Read my Terms for additional details. Absolutely amazing work. Quick, communicative and wonderful to work with. Another amazing piece, as per usual! Simply an excellent experience. No issues, all class. Wonderful experience with this artist again, truly a pleasure to work with! They took my idea and made it even better than I could have ever imagined, and I'm always extremely pleased with the final result! Quickly became one of my favourite people to work with, very friendly too. Wonderful artist to work with. Works in a timely fashion and works well with requested revisions and ideas. Would definitely recommend to anyone interested! Best artist on here, seriously. I've commissioned them about four times now, and I plan to come back! The art from this artist is beyond amazing. I cannot put into words how happy I am that I commissioned them. They were so kind in communication, attentive, and fast! If you get a chance to commission, you should! So fantastic! Absolutely beautiful work by this artist, it was a real pleasure to work with them! The final result was perfect and they were very friendly and considerate through the entire process. I will definitely be back again and would recommend to others! Absolutely stunning work, and easily one of the SWEETEST to work with. AMAZING, as always! I love working with this artist. Extremely talented artist and very professional, I cannot recommend them enough. You won't regret it. Amazing art. The artist was an absolute delight and completely transparent throughout the process. Would love to work with again. An absolutely polite and responsive artist. Will always come to seek your input and evaluate any opinion you have. A quick worker, wonderful at capturing mood and lighting and every detail of an outfit for design. I will definitely come again and I hope they increase their prices one day! They deserve more for all of this beautiful, hard work. This artist is absolutely fantastic! Quick, beautiful work with lots of communication! Fast, delightfully communicative, and high quality as always. As always, artofawang is one of the best artists on here! I will be back! Literally the cutest first art I've gotten of my character from this artist, and I could NOT be happier with it. Absolutely amazing. Fantastic artist, works at a good pace, gives a lot of updates and is very receptive in general. Could not recommend more! This artist was incredibly helpful and clear with every step of the commission, the art is beautifully done, and the turnaround time was fantastic. I'll definitely be back for more, and I'll definitely be recommending them! Definitely one of the best artists on the website! Without a doubt one of the best artists I've encountered on here. Polite, very timely. Let me know of any reasons for potential delay. VERY accommodating for changes and my initially flip-floppy mind in regards to color scheme and the like. I play on coming back! Great communication, very detailed work, love working with the artist. Seriously, artofawang is a wonderful artist, and I can't recommend them enough! Such a great artist who responded well to fixes. They were quick and a joy to speak with. Woukd recommend. The artwork is amazing! Got back to me super fast in both initial reply and finished art. Excellent work, great to work with. Commission pieces for personal use only. - A standard sketch in one sitting takes me around 1 hour. The rest of the time will be dependent on 1) time spent on back-and-forth messaging/waiting for approval, 2) the amount of commissions I am currently working on, and 3) I do have a full-time day job, though this part should not usually affect the hours I have designated to my commissions. Requesting for the refined option will obviously add to the time as well (estimated to be an extra week of work). I have the rights to use your commission piece to advertise for my commissions. If used, I will try to just use a portion of the piece in low resolution, and not repost in full.